One of the first signs of autism that we recognized in A-Man was a communication delay. He could tell us every word from his favorite Tinkerbell movie, but he couldn’t find the words to ask for water. 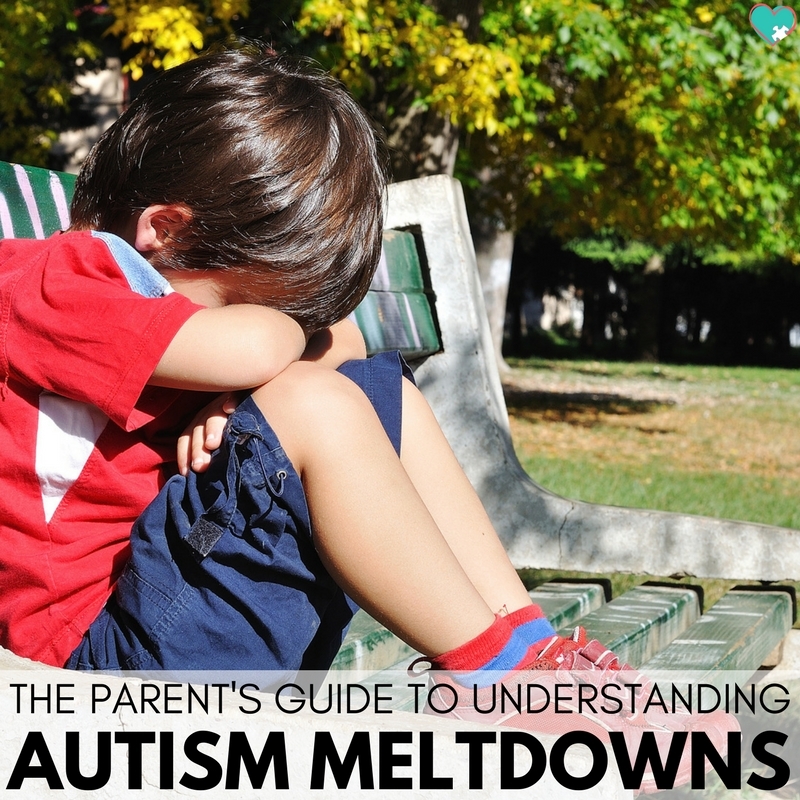 Many autistic children struggle with communication. Some are nonspeaking, while others can speak but have trouble deciphering more nuanced social cues. 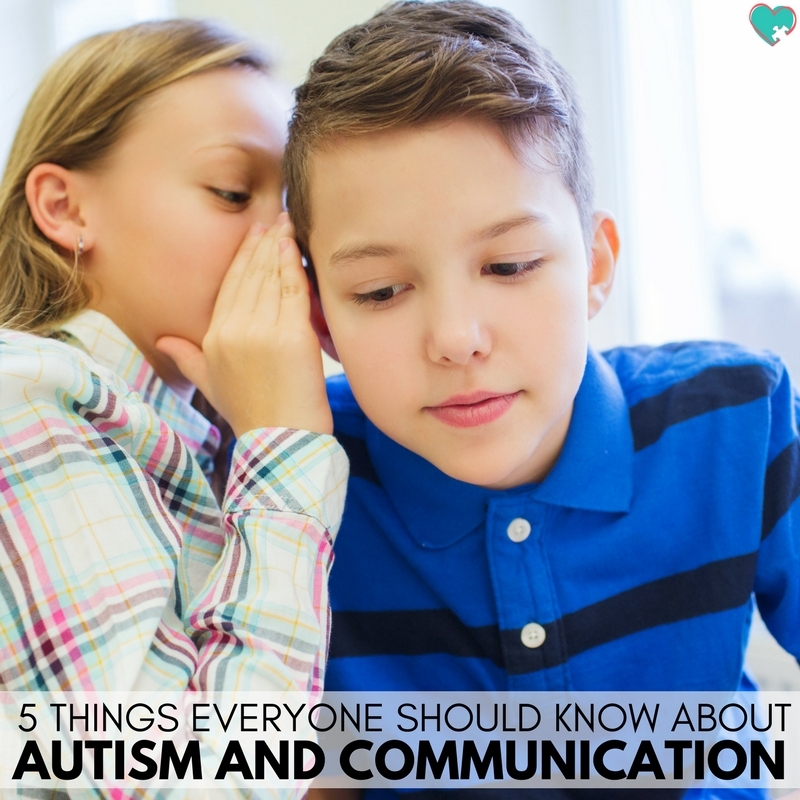 It’s important for parents, teachers, caregivers, and really everyone to have a basic understanding of the different ways that autistic people communicate, so today we’re talking about 5 things that everyone should understand about communication and autism. 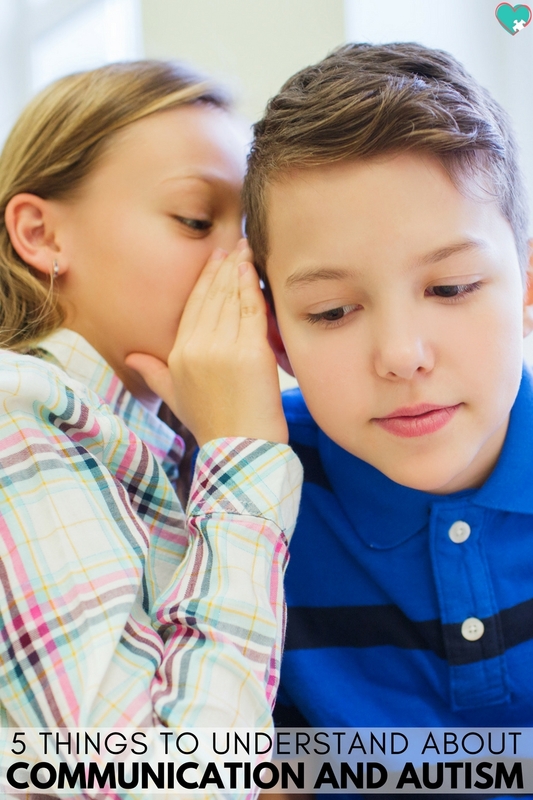 Communication and Autism: What is Echolalia? Echolalia was one of the most interesting things that we learned when we started therapy for A-Man. Echolalia is a form of scripting where autistic people use words they’ve overheard, from a movie or song, and use them in place of expressive language. As an example, for months whenever someone took something from A-Man he would say, “Give me back that dust!” a line from his favorite movie at the time. Autistic people try to fit scripts to real-life situations by either using similar words or feelings. If they are feeling sad, they may quote their favorite movie scene where a character is feeling sad, for example. Some autistic people struggle with processing communication, so it can take longer than we’re used to for responses. Sometimes we need to repeat directions to give an opportunity to process them fully, or explain things in steps. First, then explanations work wonders! Like, first we’re putting on our shoes, then we’re getting in the car. Some autistic people will instantly reject a new idea until they can process the language fully. For example, when I ask one of the kids “Would you like some more water?” sometimes almost instantly I’ll hear “no” only to 30-40 seconds later hear, “some more water?”. Try to stay patient and understand that it can take some time to process new information fully. Many autistic people, both speaking and nonspeaking, use sign language to communicate. From simple signs like “more”, “please”, and “thank you” to fully communicating with American Sign Language, using hands to communicate can be much easier for autistic people. Think about it: children learn to wave before they learn to say “hi”. If you plan to try to teach your child some sign language, start with some simple signs for useful words (please, more, food, drink, etc) and then expand into more complex language. You should also check out this free ASL printable pack from my sweet friend Kori! This is one of those tricky autism signs that gets misinterpreted a lot. Autistic people can struggle to understand and interpret social nuances and subtleties that neurotypical people easily recognize. Many people have believed the idea that because of this, autistic people cannot feel empathy. This couldn’t be farther from the truth. Autistic people can feel and empathize. Often, actually, we tend to over-empathize and can shut down because of the intense emotions. What can be a struggle, however, is deciphering hidden meanings. When people make sarcastic comments, or hide their true intentions or feelings, it can become difficult for autistic people to clearly understand. Because of this, autistic people tend to be very literal and direct. Once again, there isn’t anything wrong with this, it’s just different than people are typically used to. Be sure to speak directly with autistic people and try to avoid being overly sarcastic. Also, if you see someone taking advantage of an autistic person’s direct and literal nature, please say something. Along with subtle social nuances, many autistic people struggle to make and keep eye contact. Eye contact is an incredibly intimate exchange, and for people who process things much more deeply, it can be intimidating and uncomfortable. Avoid trying to force eye contact with an autistic person. If you wouldn’t force someone to hug or kiss you, please don’t try to force eye contact. I know that it can feel like unless someone is looking at your eyes they aren’t listening, but many autistic people can focus more on what you’re saying if they aren’t using all of their energy trying to maintain eye contact. 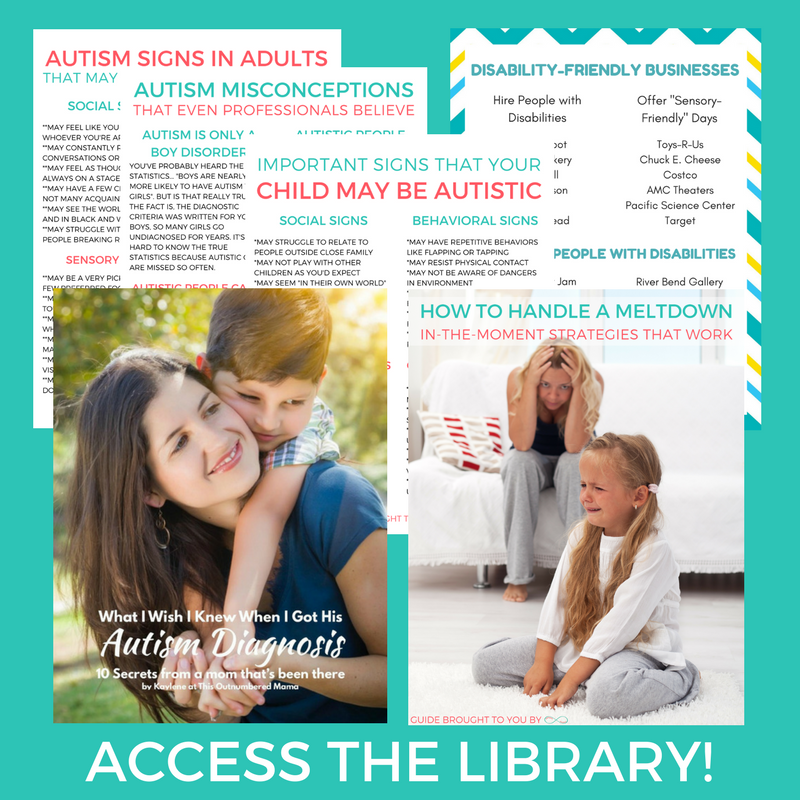 This is by no means an exhaustive list of communication-related struggles of autistic people, but I wanted to cover a few that I found the most interesting and helpful when I first got A-Man’s diagnosis and I started learning about it. 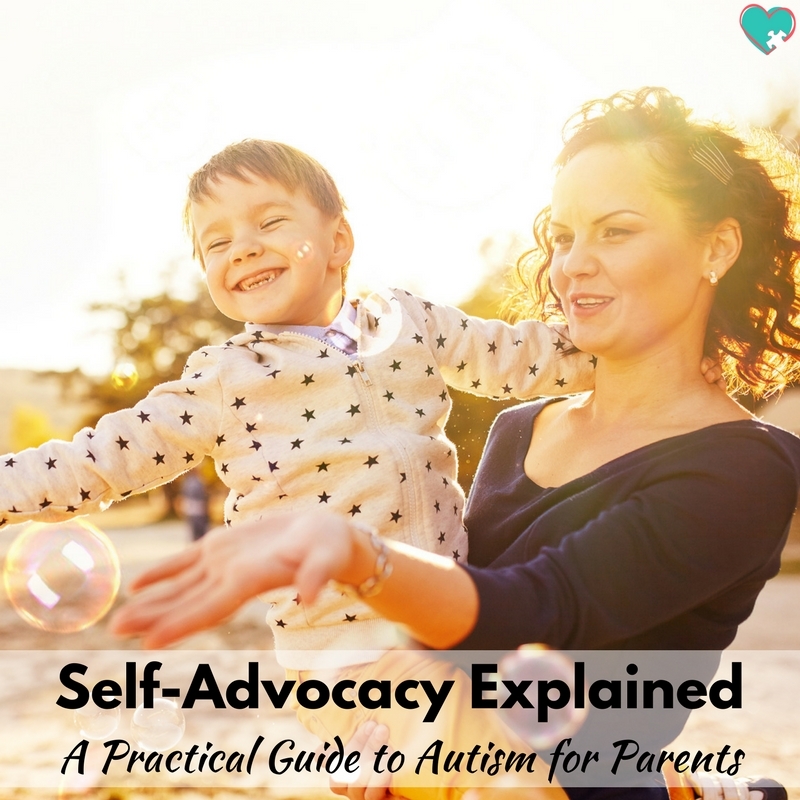 When you make an effort to understand communication and autism, you’ll be able to connect more clearly with your autistic child.